A few weeks ago Moz excitedly announced they updated their Domain Authority (DA) score. What followed was a surge of confused SEO novices and frantic clients, all wondering how they could improve their domain authority. The thing is though, Domain Authority is a bogus marketing tactic created by Moz. We repeat, DA is bogus and is NOT a Google metric meaning it has no impact on Google rankings. So what exactly is DA and why are people obsessed with it? Where did Domain Authority Come From? Way back in 2000, Google created its own marketing hype by making its PageRank (PR) score visible. Google Toolbar for Internet Explorer (what a throwback) showed a score out of 10 on a meter for how well the page ranked. In 2016, Google stopped making PR publicly visible, and it was clear that they had come to regret the Pandora’s Box they had opened. But with PageRank gone, there was a void to be filled. Which is when Moz stepped in with their “Domain Authority” metric. They’re not the only company with their own internal link scores. Majestic, Ahrefs and many others have their own tools that provide similar scores. Domain authority is simply a metric that describes the relevance of a website for a specific subject or area. There are four main areas that can influence a DA score. How one builds DA is to have both quality content and link to other sites that have a high DA score. The thing is though, Google doesn’t give a crap about domain authority. They have actively been denying that it is a metric they use to determine rankings for years. Even Moz admits that DA is not a Google metric, but that hasn’t stopped them from positioning it as one. Is Domain Authority a Valid Metric? Look, just because DA is a marketing tactic developed by a company doesn’t mean it doesn’t have value. Domain authority can be useful in assessing the quality of a website and backlinks. However, it should never be solely focused on which is what commonly happens. When used alongside other metrics is can help, but creating an entire SEO strategy around DA is a terrible idea. Domain Authority has absolutely no influence on Google rankings. A website’s DA score can drop, and Google rankings won’t even budge. It’s also not without its flaws. A number of sites with a great DA score are straight up spam. Which again is why we recommend using it conjecture with other metrics and not focusing too much on it. Most SEO agencies wish Domain Authority would go away. It’s a flash metric that SEO novices and new clients cling to because it’s easy to understand (and packaged prettily). But it holds very little true value in terms of SEO. 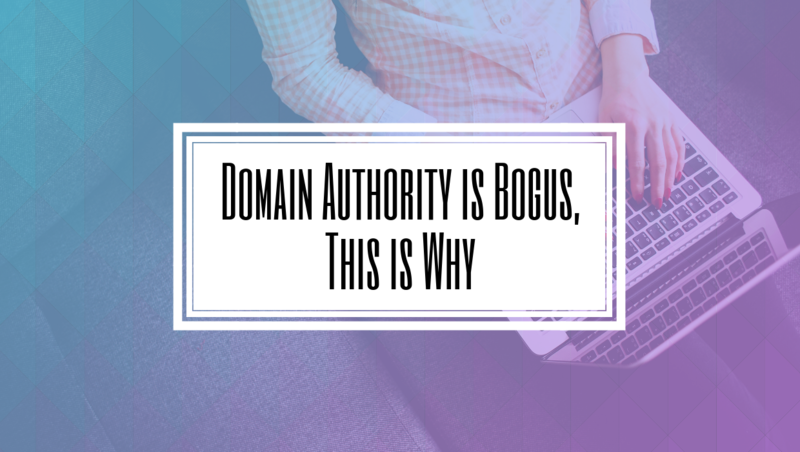 Focusing too much on Domain Authority, and holding it as truth, can lead you down a very bad path. It’s better to focus on the metrics that Google actually uses to rank websites. So if any company tries to sell you on the idea that they can improve your rankings through Domain Authority, run away. Quickly.